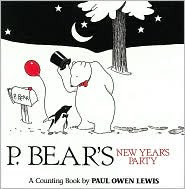 P. Bear has sent invitations to all of his friends for a New Year's Party. On the big day a variety of animals arrive, starting with one whale and ending with a dozen penguins. The book is filled with black-and-white animals, and each page shows a clock as readers count the hours up to midnight. 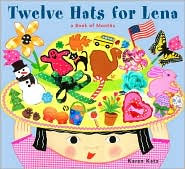 Lena creates hats appropriate for each month of the year. Two mice describe their love in terms of the special characteristics of each month of the year. This seek-and-find book is full of things to look at as you journey around the changing year. Toot it loud and clear. To welcome the new year! Read one of the new year stories and then make a paper plate noise maker. Talk to your child about how it is a tradition to make loud noises when the clock reaches 12 midnight on New Year's Eve and people shout out Happy New Year! Then fold the plate in half and staple half way around the plate edge. Then let your child put a handful of dried beans or dried pasta noodles in the open half and then continue stapling the plate closed. If you want to add some ribbon, punch a few holes with a hole puncher on the edge and knot it. Then shake your noise maker. Practice counting down from 10 and then shaking your noise maker. Read one of the New Year book titles and, again, talk about some of the noisy traditions that occur when the clock hits midnight. Then make your own New Year's Horn. You will need a toilet or paper towel roll, a rubber band, and a small square of wax paper. Cut one or two holes about one inch away from the bottom end of the tube. Put the wax paper square over the bottom end and keep it in place with the rubber band. Then let your child decorate the tube. (You could have them decorate or paint it, before putting the horn together--either way). Then hum into the open end like a kazoo. Read one of the New Year books and then make a crazy party hat to wear on New Year's Eve. You will need to print off a set of clocks, cut out two small rectangles of colored paper(I used the clocks to help me judge the size of the rectangles), two pipe cleaners, and a paper plate. Cut your paper plate like the photo above and write Happy New Year or 2009 on the middle. 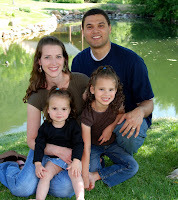 Fold the middle part forward so that it will be standing up on your child's head. Have this ready before you start the activity with your child. Next, (do this part in advance too), staple the pipecleaner to the inside of your rectangle and glue closed by folding the rectangle in half. Do the same thing to the other side. You may need to put something heavy on it to keep it closed until it dries. Give your child the paper plate and a bunch of art supplies that you have on hand and let them decorate their hats however they want. They can color it, they can glue things to it, they could paint it---whatever they want to do to spice it up. Set it aside and let it dry. Once it is dry add the clocks to the front of the rectangles and attach the pipecleaners to the rim of the hat. 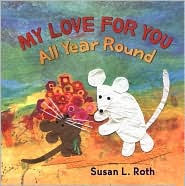 Read one of the book titles that talk about the months of the year and then make your own mini calendar book to help your child understand the sequence of events that happens in a year. This is a great way to help young children understand what it means to begin a new year since time is sort of hard for them to understand. Holidays and celebrations are a good reference point for understanding a continuum of time for kids. You will need 4 pieces of construction paper, each piece cut in four so that you have 16 small rectangles. Staple 13 of the rectangle pages together to make a book. Write the title "A month for everything" on the cover. Label each page with the a different month, starting with January and continuing on in order. Copy and paste each of the clip art pictures listed below into a word document, dragging the photo so you can fit 4 clip art pictures on a page. Then let your child color the pictures and cut them out. You have such fabulous ideas, Amy. You really help me be a more crafty mom. Thanks for sharing this great posts. I will be able to use them one of these days. The kids back at home use coloring tools since they love to color, got one cool coloring pages for all occasions on thecolor.com.